After you buy the plugin, you should receive an email receipt from Nose Graze. This email will contain a link to download a .zip file containing the plugin. Once you have the zubb-icon-tags.zip file downloaded, login to your WordPress site. If you wish to enable automatic updates, you need to enter your license key. To do this, navigate to Ultimate BB » License. You'll see a new box there specifically for the Icon Tags License. Enter your key there and press "Save Changes". You can add the icon tags to the book information section. This is done in Ultimate BB » Book Information in the "Configuration" section (shown below). Drag the "Icon Tags" box where you want it to appear. You can manually display the icon tags with a shortcode. Just type [icon-tags] in your post exactly where you want them to appear and they'll be added automatically. 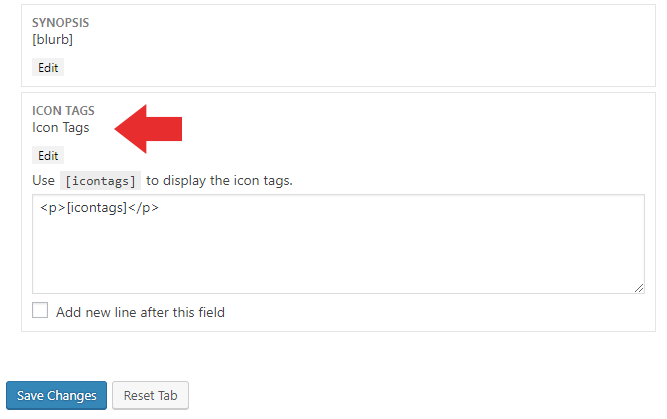 To create a tag, navigate to Posts » Icon Tags. There's a simple form you can use for creating a new icon tag and uploading an associated image. When creating a blog post, you can "tag" it with one of your icon tags. This works just like adding a post to a category. There's a similar interface on the right-hand side called "Icon Tags". Simply select the icon tag you'd like to apply to this post/review. If you have multiple books enabled, you will also need to type the name of the icon tax in the text box with the main book information. So if I've selected "Epic Romance!" in the sidebar, I'd need to type that same name in the text box, as shown below. The icon tag for "Epic Romance!" will then appear with the book information, or where the shortcode has been entered.